Japanese red-crowned crane pair in a snow storm. Sigma 150-600 Sports lens and Nikon D810, 1/30s, f/11, 150mm, ISO 64, EV + 1.3, Manual mode with Auto-ISO, UniqBall UBH 45 head and Jobu Algonquin Carbon Tripod. Japan really delivered this year with great conditions, superb opportunities for our tour and thanks to a really wonderful group of people the trip was a big success. Sitting in my office in Los Angeles with 87 degree weather outside I am wishing I was back in Japan right now! Japanese red-crowned cranes displaying in the snow. Sigma 150-600 Sports lens and Nikon D810, 1/1250s, f/7.1, 550mm, ISO 64, EV + 1.3, Manual mode with Auto-ISO, UniqBall UBH 45 head and Jobu Algonquin Carbon Tripod. There are four main areas that are visited on my Japan tour. We started out in Tokyo and moved to the beautiful Nagano area, sometimes known as Japan's Alps, on the first day to target snow monkeys at the famous monkey park. Then we traveled to the northern island of Hokkaido to target the rare Steller's sea eagle, whooper and the ultra rare Japanese red-crowned crane for the next nine days. This amount of time almost guarantees that you will see excellent snow and ice conditions for eagles and cranes. The Weather When photographing cranes in Japan you hope for at least one day of snow, this year the weather delivered with a few days of snow storms and even a couple of blizzards to make things interesting. Thankfully at the crane park even in bad weather you are always few steps away from a heater, warm food and drinks. Out of the nine days on Hokkaido we had a great mix of all kinds of weather, snow, cloudy, and overcast with only two days of full sun. In Japan clear weather is not ideal since it means harsh light and usually lower temps. Japanese red-crowned cranes in Hokkaido. All Sigma 150-600 Sports lens and Nikon D810 and UniqBall UBH 45 head and Jobu Algonquin Carbon Tripod. I recommend telephoto zoom lenses for locations like a crane park where you are limited to a certain distance. The images above were made at focal lengths from 200 to 600mm all made without having to change lenses. When you don't have to stop and change the lenses, or switch the bodies, you can relax and concentrate on expressing your creative vision. This strategy has proven to work very well for me over the years in Japan. Since I decided not to bring a big prime lens this year all of the images in this post were made with the new Sigma 150-600 sports lens in Nikon or Canon mount. How did this lens work over a 500 or 600 prime? I can tell you I didn't miss flying, carrying or shooting with a prime lens for one second and I will not be bringing a long prime lens next year thats for sure. On this trip I carried a new (medium sized) F-stop photo backpack with not one but two Sigma 150-600 sports lenses, with hoods on, and a Sigma 24-105! Red-footed red-crowned crane bank top view at the Akan crane park. Sigma 150-600 Sports lens and Nikon D810, 1/1600s, f/6.3, 600mm, ISO 640, EV + 1.3, Manual mode, Handheld. The Cranes The japanese red-crowned cranes have a more highly developed display and mating behavior than typical cranes like the sandhills. In one hour an entire large group of cranes will display over and over again. This is one of the reasons I never seem to get bored of shooting the JRC cranes. The japanese red-crowned cranes are the rarest on the planet with total numbers less than 3000. The non migratory population on Hokkaido number about 600-1000. Japanese red-crowned crane dropping in during a snow storm. Sigma 150-600 Sports lens and Nikon D810, 1/1600s f/8, 600mm, ISO 1100, EV + 1.3, Manual mode with Auto-ISO, UniqBall UBH 45 head and Jobu Algonquin Carbon Tripod. We spent four full days targeting cranes at two main locations and a couple of backup spots to make sure we get the cranes in optimum conditions. This is my favorite photographic combination on Hokkaido, it just doesn't get any better than 50+ cranes calling and displaying in falling snow, sometimes all at once! Snow monkey nit-picking in the sun at the monkey park. Sigma 150-600 Sports lens and Nikon D810, 1/500s, f/11, 300mm, ISO 200, Manual mode with Auto-ISO. UniqBall UBH 45 head and Jobu Algonquin Carbon Tripod. Over the years I have spent lots and lots of time around the monkeys in Japan and it never gets boring. The young monkeys like to keep moving and seem to always be up to mischief and the adults are always seem to be doing something interesting. Napping in each others arms. Sigma 150-600 Sports lens and Nikon D810, 1/500s, f/11, 380mm, ISO 560, Manual mode with Auto-ISO, +0.7 EV. UniqBall UBH 45 head and Jobu Algonquin Carbon Tripod. The monkey park can get crowded, this year was the busiest year ever at the park, but the wave of crowds eventually thin out leaving with some very good, sometimes excellent opportunities. Young snow monkey checking out my camera under the watchful eye of its older sister. Sigma 150-600 Sports lens and Nikon D810, 1/500s, f/8, 380mm, ISO 560, Manual mode with Auto-ISO, UniqBall UBH 45 head and Jobu Algonquin Carbon Tripod. Japanese red-crowned cranes in a blizzard. Sigma 150-600 Sports lens and Nikon D810, 1/30s, f/11, 150mm, ISO 64, EV + 1.3, Manual mode with Auto-ISO, UniqBall UBH 45 head and Jobu Algonquin Carbon Tripod. My group was lucky to see and photograph the cranes in blizzard conditions. It was amazing to see the cranes react to the blizzard conditions by forming a tight group and big gusts of wind triggered an alert posture of some kind, anyway the blizzard definitely got their attention, as you can see in the image above. It really seems like the cranes enjoy the snowy weather because as soon as the wind would die back down just a little they would spread out and start a frenzy of displaying even going into copulatory stances a few times. It might seem like a bad thing to check the weather and see extreme weather warnings highlighted in bright red for the area you will be shooting in all day. On the contrary bad weather often means great photo opportunities. Japan continues to still have plenty of snow, thankfully, something that has been the case in Alaska over the last couple of years. Hokkaido is still the best location on the planet to photograph the steller's sea eagle and for anyone that loves to photograph eagles seeing the SSE on pack ice is something that you will never forget. We spent two days photographing the steller's and next year I will be adding additional photo sessions. My group had perfect timing as the blizzard that gave us the awesome conditions for the cranes shut down the roads to the eagle peninsula and not only kept everyone from leaving town but also kept the eagle boats in the harbor for 3 days. If you have ever thought about photograph the steller's sea eagles in Japan do it now. The pack ice has been steadily declining over the years and due to the huge increases in gas and oil development in the region who knows how much longer this will be happening (for example a Russian oil rig was lost in Jan in the area). Also the world's population of SSE is less than 5000 and is declining steadily every year. Steller's sea eagle banking hard against a sea ice background. Sigma 150-600 Sports lens and Canon EOS 7D Mark II, 1/1600 s, f/7.1, 270mm ISO 640, Manual mode with Auto-ISO and +2/3 exposure compensation (yes EC in manual mode) handheld. Steller's sea eagle hard bank image made with my new Canon 7D EOS Mark II. This lightweight combo with a 240mm to 960mm range and 10 fps is just about perfect for the eagles in flight. FYI, I am putting together a future post about my findings with this camera and lens combo right now. Steller's sea eagles perched on sea ice in the Nemuro Straits. Sigma 150-600 Sports lens and Nikon D810, 1/1250 s, f/6.3, 600mm ISO 7200, Manual mode with Auto-ISO and +0.7 EV , handheld. Steller's sea eagle redirection against the Shiretoko Peninsula in morning light. Sigma 150-600 Sports lens and Canon EOS 7D Mark II, 1/2000 s, f/8, 240mm ISO 400, Manual mode with Auto-ISO and +2/3 exposure compensation (yes EC in manual mode) handheld. Being able to photograph the steller's sea eagle in flight is definitely a highlight of this tour. They are easy to distinguish from the white-tailed eagles also found at the same spot by the way they fly. Thankfully they are slower and the darker color, almost black, makes an easy target for your camera's AF system. White-tailed eagle top view bank. Sigma 150-600 Sports lens and Canon EOS 7D Mark II, 1/2000 s, f/8, 534mm ISO 200, Manual mode with Auto-ISO , handheld. Another highlight for me was photographing the smaller white-tailed eagles. A close cousin to our bald eagle the WTE or white-tailed eagle can be found all over Asia and Europe but there is not another place on earth where they are so tame and easy to reach and photograph at close distances. As I sit in my office writing this blog in Southern California I cant help but think about what fantastic opportunities we will find next winter in Japan and I can hardly wait to make it back to Hokkaido to lead my 2016 tour! I hope you can join us. 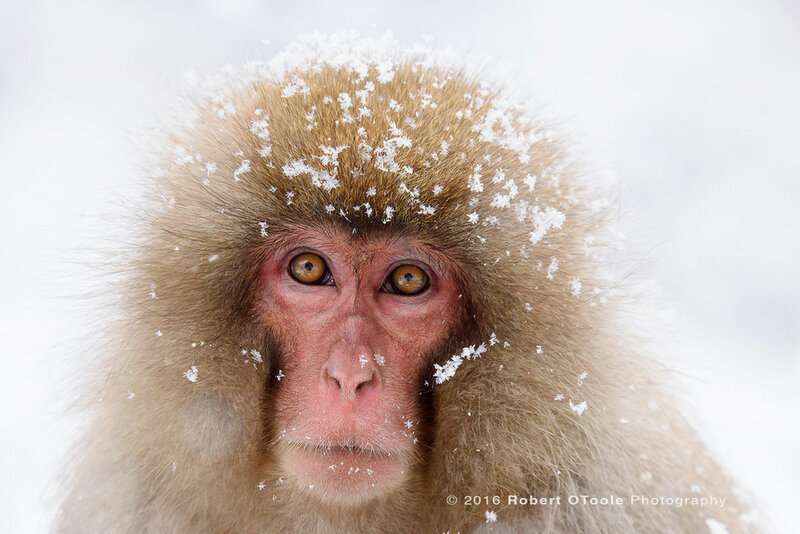 2016 Japan Winter Wildlife Tour Sunday February 21st - Saturday March 5th, 2016, 14 Days: $8200. Deposit $3000. Maximum 6 photographers + Leader Robert OToole and co-leader. Single western style single rooms, mini bus (van) transport, mobile Wi-Fi, small group size of six, english speaking guide and special afternoon eagle photo sessions. My first week back in Japan has been great so far with great light, huge piles of snow everywhere and I am with the best group of people I have ever led in Japan. This was the year of the baby monkey with 75 young ones born at the park but this was also the busiest week ever at the monkey park with great weather and the chinese new year holiday creating the perfect storm of crowds but overall the conditions were still great. Below is a 100% pixel crop of the above image to give you an idea of what image quality the 150-600 sports lens is capable of. This was my first trip to Japan without any prime lenses and my Sigma 150-600 and 120-300 lenses are working out great so far. 100% actual pixel crop NIKON D810 with Sigma sports 150.0-600.0 mm lens. BTW this image was shot at f/11 which is not the lenses sharpest aperture. Currently I am shooting with a new Sigma 150-600 Sports Lens, my new favorite lens by the way, and will be posting a review of the lens here soon. Until then I wanted to post some quick results of center sharpness at 600mm, wide open, the focal length and aperture that should be of interest to a lot of people. I will post lots of images of real life subjects and more map images at other apertures and focal lengths soon. 150-600mm F5-6.3 DG OS HSM Sports lens on Nikon D810, OS off. Live view focus, AF lock, Manual mode, 1/1250 s, f/6.3, Auto ISO, EV at 0. Be sure to click on any image below if you would like to launch the viewer and see a larger version on the image. The results here speak for themselves, sharp at the center wide open at 600mm. Stopped down 1/3rd - 2/3rd stop and at shorter focal lengths the sharpness improves pushing the results into prime lens territory. I think Sigma is going to have a hard time keeping up with sales of this lens!